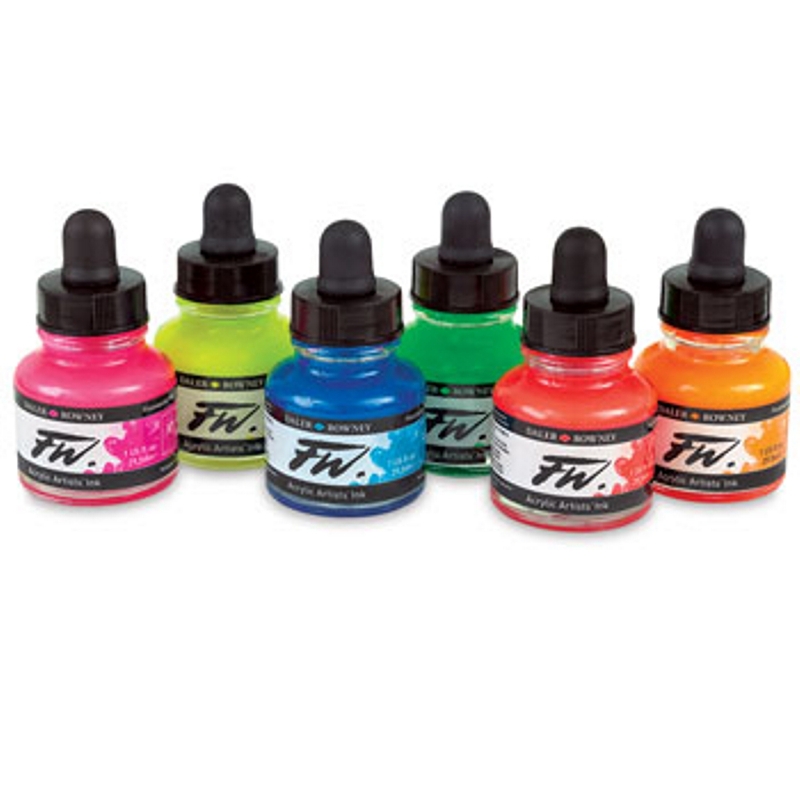 FW Artists' Ink is an acrylic based pigmented water resistant ink which have 3 & 4 star ratings for permanence.This high degree of lightfastness makes it ideal for the production of pictures for permanent display. The inks are pigment based giving good colour strength and fluidity. The colours can be substantially diluted to achieve the most subtle tones, very similar to watercolour. Such washes will dry to a water resistant clear film and successive layers of colour can be laid over in a highly predictable manner. The combination of subtle tone and strong colour overpainting suggests really interesting creative possibilities. FW inks also work well with airbrush and technical pens. The range also includes a series of Fluorescent (Neon) Colours listed below. Acrylic inks are made using a pigment and a binder much like oils, acrylics and watercolours. Sometimes the binder and pigment may separate in the bottle and will need shaking to mix them again so that they are ready for use. This is more common in colours such as white and yellow, so you may find that these colours need more shaking than darker colours. The degree of separation varies from one range to another, and should not be considered a fault.